Sauerkraut Mashed Potato Casserole is a warm and hearty dish made with sauerkraut, apples and creamy homemade mashed potatoes. It's a delicious comfort food side that you can make ahead and that's always a hit! Place the potatoes in a large pot or dutch oven and cover with 1 inch of water. Bring to a boil over high heat, then reduce to a simmer and cook until the potatoes are tender, about 15 minutes. Meanwhile, in a medium saucepan combine sauerkraut, apple cider, bay leaves, chopped apples, and cumin seeds. Bring to a boil and let simmer with the lid on for 15 minutes until the apples. Season with salt and pepper. When the potatoes are tender, drain them in a colander. Process the potatoes with a potato ricer into a large bowl or use a potato masher for chunkier mashed potatoes. Stir in the melted butter, warm half-and-half, salt, pepper, nutmeg, and Dijon. For the topping, heat 2 tbsp butter in a skillet over medium-high heat. Add the breadcrumbs and toast them while stirring constantly until golden brown, about 1-2 minutes. Take them off the heat and let them cool, then toss them with the parsley and season with salt and pepper to taste. Set aside. 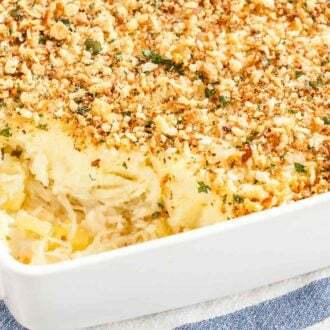 Transfer the apple sauerkraut into a 13 by 9-inch baking dish, spread mashed potatoes on top, and sprinkle the cheddar cheese evenly over the mashed potatoes, followed by the breadcrumbs. Bake the casserole until the cheese is melted and the breadcrumbs are crisp and browned, 25 to 30 minutes.